You might wonder: how do you bake dessert if it doesn’t include eggs and butter? Well, there are many different substitutions in the vegan world. Some people use apple sauce as a binding agent and there are many vegan butter options, such as olive oil and earth balance. Check out these vegan cupcakes! And guess what? Vegan treats can taste just as good as normal baked goods! Wildflour Vegan Bakery Cafe ensures that all the vegans in and around Providence, RI, can indulge guilt-free. 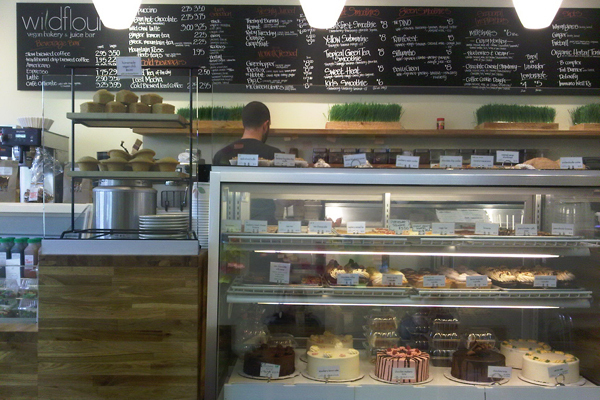 The bakery is only a short bus ride from the Brown University’s campus (or a 3 mile walk/jog/run north). 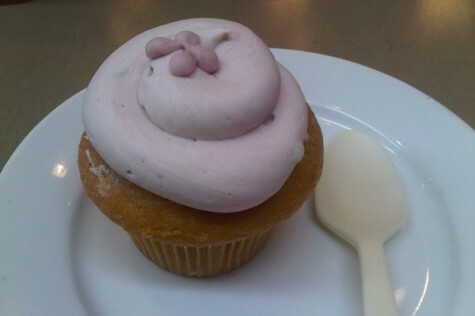 During my latest trip to Wildflour, I fell in love with their new spring/summer lavender lemon cupcake. My first bite was heavenly. The first thing that hit me was the rich and creamy texture of the icing that was a nice balance to the full-bodied cake. The light hint of sweet lavender was just perfect for the cupcake. But what about the lemon? It was hidden in the core as an apple-lemon puree…a very pleasant surprise. Mmm… healthy and delicious! I am happy to see more people attempting to change the way we think about food and what we are consuming– Consumers have the right to know where their food comes from and how animals are treated before they reach their plates. This is a good, short video to watch about this topic: MeatVideo.com. Or visit ChooseVeg.com for information on adapting a more compassionate lifestyle.